Tender lamb might seem time-intensive, but it's actually quite simple to prepare. This 15-minute recipe makes for a no-fuss spring meal that tastes like it took all day to make! Tender lamb might seem time-intensive, but it's actually quite simple to prepare. This 15-minute recipe makes for a no-fuss spring meal that tastes like it took all day to make! Make sure your pan has had a chance to get very hot for best results. This seals in the juices of the lamb and makes it moist. This recipe is created for a quick and easy meal. If you can plan ahead the lamb is even more tender and flavorful if given a chance to marinate for a few hours. A good rule of thumb when testing lamb for doneness is try not to cut into it while cooking as it releases its juices. The more done the lamb is the firmer to the touch it will be when pressed. This takes a little practice at first to know just how firm medium is. Also, it will continue to cook after removing from the heat, so remove while it is still a little less done than your personal preference. You can also use an instant reading thermometer. It doesn't release as much juice as cutting when used. Medium rare is about 145 degrees. Mix together lemon juice, rosemary, pressed garlic, salt and pepper. Rub lamb chops with mixture. Set aside on plate. 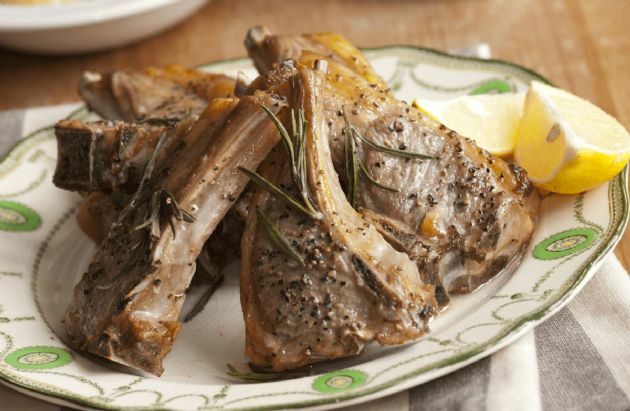 Once pan is hot, place lamb chops in pan, and return to broiler for about 4-5 minutes, depending on thickness of lamb. Lamb is cooked quickly as it is cooking on both sides at the same time.